For Day 18 of Vegan MoFo, I would like to honor the dog (well, I’d like to honor all of them!) who inspired me to first go veg. In addition, he and his brothers have all given me feedback so that I can write a review of some store bought vegan dog biscuits. 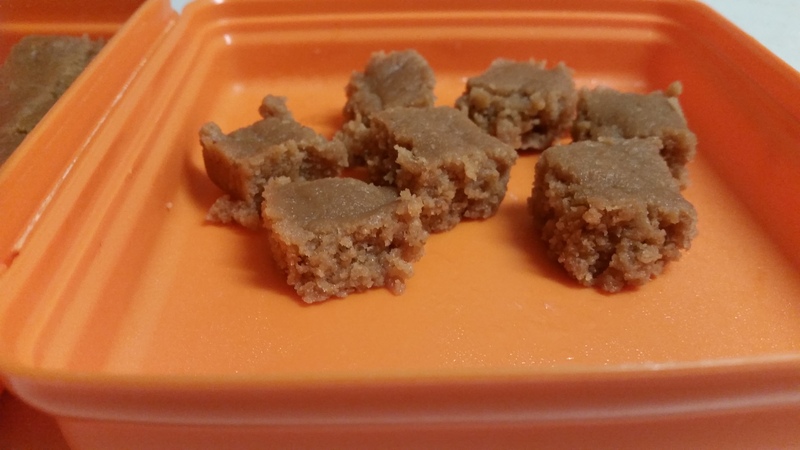 As an added bonus, I’m going to share my SUPER simple recipe for homemade dog treats, which I believe are their ultimate favorite. 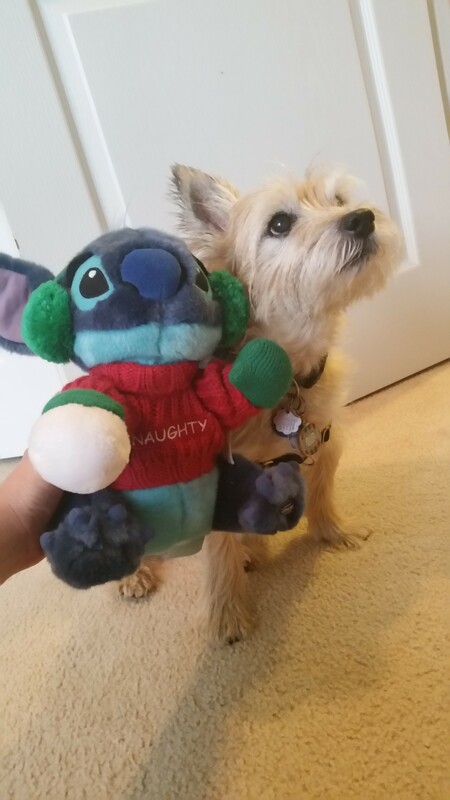 Back in 2003, I got my first dog, Stitch. I loved him so much and it got me wondering why we ate some animals but loved others. I never liked eating meat as a child anyways. It grossed me out. A short time after meeting Stitch, I decided to go vegetarian. It was an easy decision to make, but not always easy to implement since I didn’t know any other vegetarians. I stuck with it, though. Several years later, I learned about the horrors of factory farming and decided to go vegan. Yes, I named him after the Disney character. 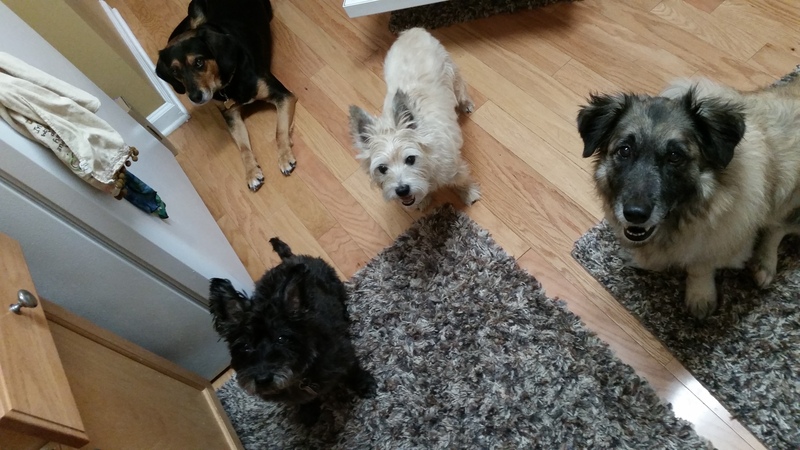 I’ve found several vegan dog treats and the boys seem to love them all. As you can see, Reno was the only one interested in smiling for the photo. The others were too excited about the treats. This proves that dogs don’t need meat to be happy! Fruitables The crunchy pumpkin-based line includes several flavors that are vegan. They smell yummy, too. Sammy Snacks I’ve bought the blueberry and the carob flavors and the dogs go crazy for these. When you open the bag, they smell AMAZING! Darford is another favorite. I have bought the peanut butter flavor and they were a hit. I should mention that most of the above mentioned treats are not only vegan, but also grain free. This is because one of my dogs is on a grain free diet. 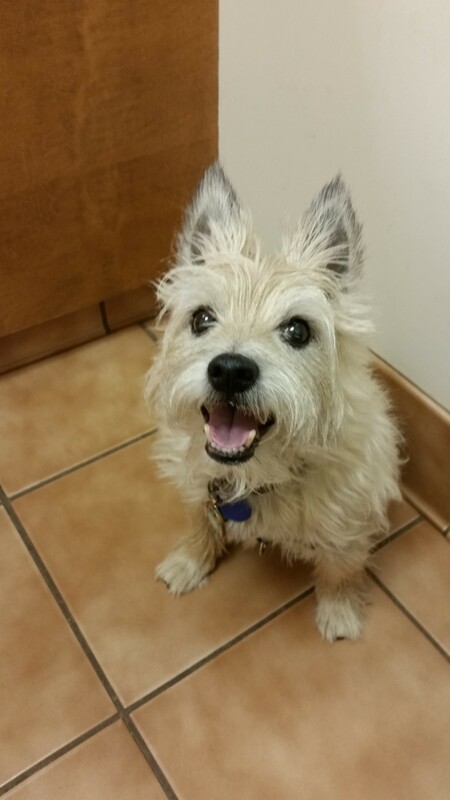 If your furbaby is ok with grains, there are more options for you, including one in particular that I’ve spotted at the big box pet stores – Old Mother Hubbard Just Veg’n. On to the homemade treats! I told you they were easy and I meant it. 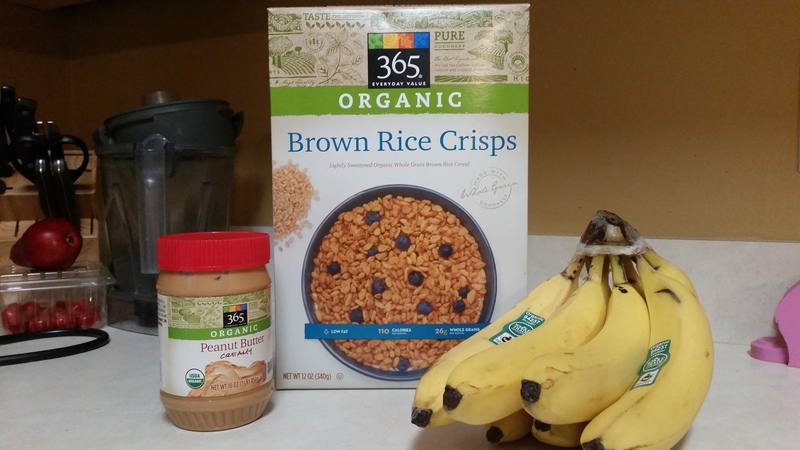 I use 3 ingredients for them – crisped rice cereal, banana, and peanut butter. I have experimented with adding a bit of canned pumpkin as well, but in the interest of ease, I like to stick with the 3 ingredient recipe. Put the cereal in the food processor and process it into a powder. 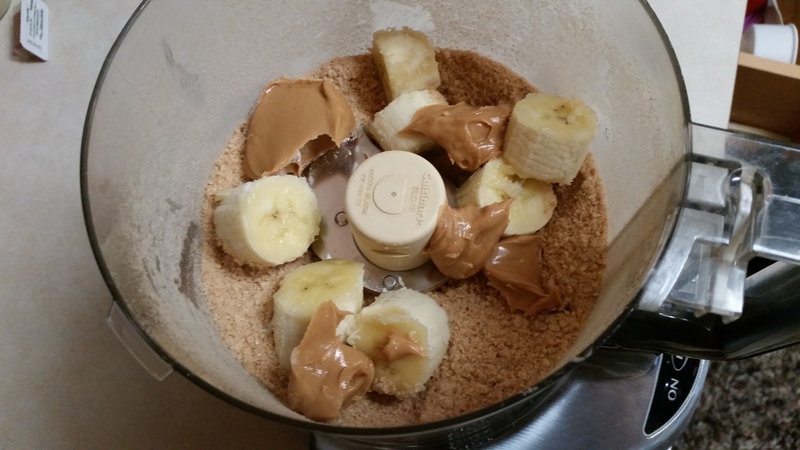 Then add the chopped banana and peanut butter and process until it’s a nice, gooey consistency. 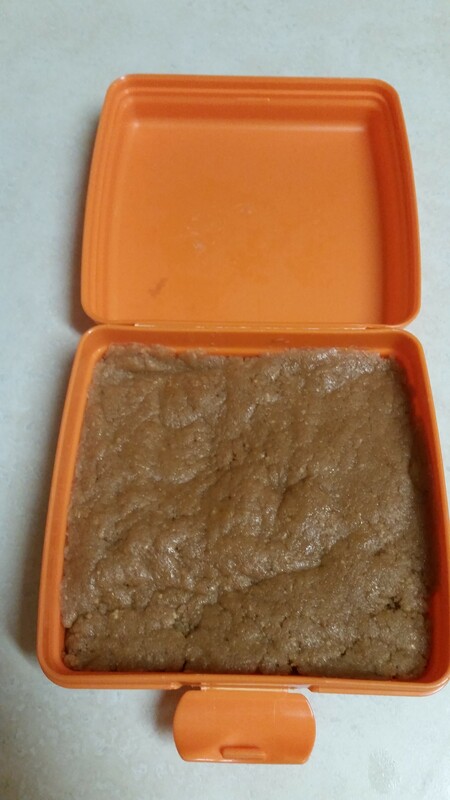 Next, press the mixture into a pan of some sort and then pop it in the fridge. It will harden just a little bit but they will still remain soft and chewy.